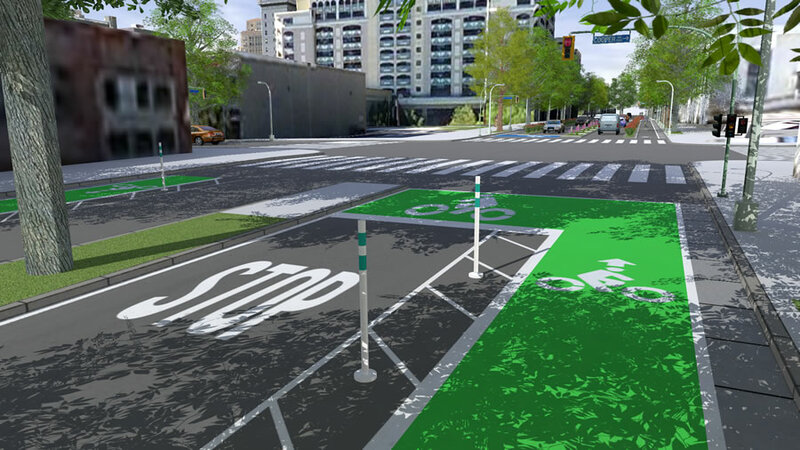 Alternative visualizations of new bike lanes, in 3D, can be generated using the New Complete Streets styles in Esri CityEngine. 3D visualization and design using GIS technology will be one of the main themes at the Geodesign Summit, which returns in January to Esri headquarters in Redlands, California. People are visual creatures who see the world in three dimensions. It makes sense that 3D technology should play an increasing role in making the complex easy to understand. The complexity of the many layers of spatial and nonspatial information that can go into a geodesign workflow requires that information be communicated via intuitive media so people understand it more easily. When 3D technology is used with intuitive media, both nontechnical and technical observers can better grasp the behavioral and aesthetic impacts of proposed change in the context of the world around them. A virtual world of the Vilans Strandängar area in Kristianstad, Sweden, was created by integrating GIS with the Minecraft building game. 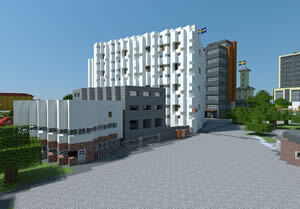 3D visualization by SWECO. Geodesign is a collaborative, iterative process. It requires frequent and sometimes rapid design modifications guided by feedback on the impact of those design choices. Professionals who practice geodesign—the geodesigners—also need to communicate plans and proposals among themselves and with stakeholders and citizens who are impacted by proposed changes to their environment. Cities, engineering firms, and regulatory agencies understand that a project's success often depends on the ability of the people affected by the changes to clearly and quickly understand key details, benefits, and impacts. Both geodesigners and software developers are trying to improve the capabilities of tools and processes to support inclusive, innovative, and informative geodesign practices. At the Geodesign Summit, they will demonstrate how 3D geospatial technology such as Esri CityEngine is being used in projects around the world. For example, the Singapore Redevelopment Authority uses CityEngine for urban planning. (Watch the video.) And Idaho State University is creating 3D web scenes of downtown Pocatello, Idaho, to show design change options for the Portneuf River channel system. Esri president Jack Dangermond will open the summit, presenting an overview of advances to Esri 3D capabilities across the ArcGIS platform. Esri product development staff will showcase some of the work that is being done to help customers enhance their geodesign efforts with 3D. 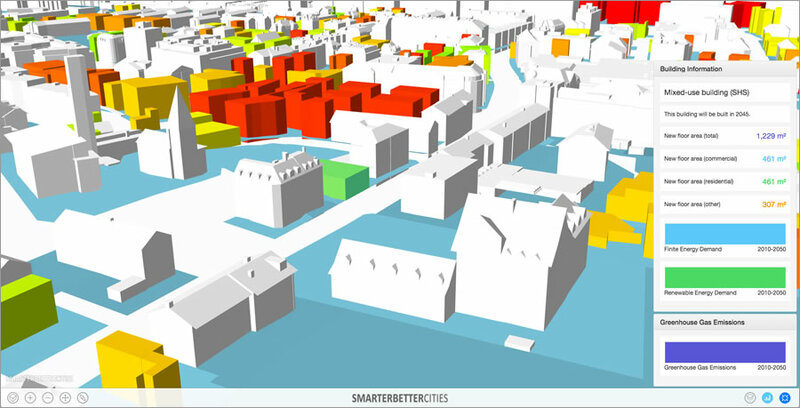 SmarterBetterCities uses 3D to enable cities to visualize carbon and energy performance. 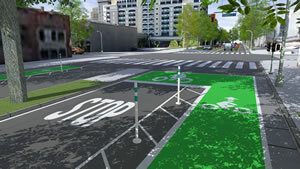 Esri technology being featured will include new Complete Streets styles that allow Esri CityEngine users to rapidly generate alternative visualizations of new bike lanes, bus and rail lines, "parklets," (mini parks), and realistic trees depicted by species. Esri staff will demonstrate how Singapore has improved planning processes by using 3D models for rapid analysis of sun shadow and wind impacts within the city. Esri staff will show new capabilities that give CityEngine and ArcGIS Pro users the ability to publish 3D visualizations on the web using either the desktop or a web browser to aggregate data and begin telling their stories in 3D. Ulf Månsson, senior project manager and partner manager at SWECO, will present 3D gaming initiatives that incorporate GIS into Minecraft to engage citizens and promote learning. Joseph Minicozzi, AICP and principal of the econometric consulting firm Urban3, will discuss how 3D visualization is enhancing geodesign and helping cities make smarter economic decisions in the face of dwindling resources. Nathan Brigmon of Civic Analytics, will describe how Esri CityEngine is being used to help illustrate proposed changes to urban rail networks in Austin, Texas. Antje Kunze, cofounder and CEO of SmarterBetterCities, will discuss a smart zoning app that helps cities use 3D to drive decision making within complex regulatory and analytical processes. SmarterBetterCities uses 3D to help cities analyze and plan complex zoning scenarios. Donna Delparte, assistant professor at Idaho State University in the Department of Geosciences, will present work that integrates historical information and planning data to compare past, present, and future scenarios for the Portneuf River in Pocatello, Idaho, which currently flows through a concrete channel through the city. "Geodesign lets us consider all the characters of nature and the beauty of our environment and integrate them into our design processes," said Dangermond. "The addition of 3D visualization and design tools and techniques gives us the opportunity to make these design decisions in a much more realistic manner—in 3D, which is how we actually see and experience the real world."